Shure KSM8 Dualdyne Vocal Microphone Review - A New Icon? 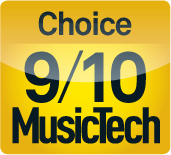 Shure KSM8 Dualdyne Vocal Microphone Review – A New Icon? Shure microphones are iconic. The SM57 and SM58 are ubiquitous both in the studio and on stage, and countless images make use of the Model 55, the classic ‘Elvis mic’, whether it’s on websites, posters or even jewellery. Matching such a strong pedigree with a new microphone is a tough task, but one Shure hopes to achieve with the new KSM8 Dualdyne vocal microphone. 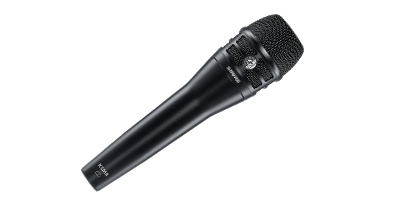 The Shure KSM8 is available in black and nickel, as a wired microphone or with a selection of wireless options. The mic comes with a stylish padded case, far more substantial than the usual Shure leather cases, and a microphone clip with adaptor. On review is the black finish, wired model. The Shure SM58 is the vocal microphone to beat for live performance. It’s a standard issue on most stage riders, and every venue will have at least one, if not many more. Even in studios, the SM58 is a popular vocal mic, particularly for occasions when a better performance may be achieved by giving the singer a mic to hold, while the dynamic nature of the mic can act as natural compression and EQ compared to the more detailed condenser mics. However, despite its popularity, the SM58 isn’t a perfect microphone: notably, the low-end buildup caused by the proximity effect can make the mic sound boomy, particularly when used by vocalists with poor technique, and the slight lift from around 2kHz doesn’t suit every singer, often exaggerating nasal qualities in the tone. The KSM8 attempts to rectify both of these issues without resorting to active circuitry or a condenser capsule, both of which would require phantom power, and often introduce new problems, particularly in a live environment. The big new development in the KSM8 is the capsule, which replaces the standard Unidyne III cartridge in the SM58, with a new dual-diaphragm cartridge. This new Dualdyne cartridge reduces the proximity effect and should produce a more linear frequency response. 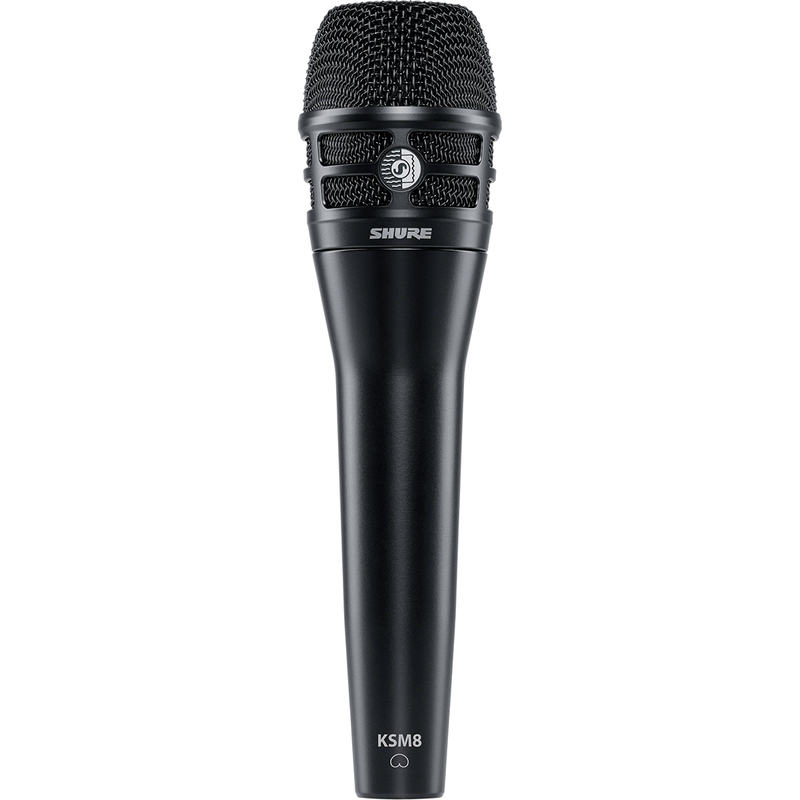 The KSM8 is more refined than the SM58, and while the extra cost may put some singers off, it will last decades and should easily pay for itself over its lifetime. Of course, there are several alternatives, both dynamic and handheld condensers, but Shure will always be the name to beat. On a male vocal, running through a small venue PA (Allen & Heath Qu-32 and Yamaha mains), we were able to get a rich-sounding vocal quickly. The lack of proximity effect was noticeable, leaving the low-end roll off to deal only with room noise, while at the top, we were able to add a subtle air boost without any hint of the nasal edge that is present in the SM58. We also noticed that we were able to get more gain out of the mic before feedback than we were with an SM58, although how much of this is down to the specifics of our room is hard to tell. With the rest of the band in action, the KSM8 cut through in the mix nicely, ensuring everyone in the audience could make out all of the lyrics throughout the performance. Back in the studio, we tried using the mic on a female low-harmony vocal line. The main vocal had been recorded with an Aston Origin, and we wanted something to sit alongside the Aston without cluttering the mix. The KSM8 worked perfectly. The part needed some hefty low-end EQ carving to sit with the main vocal without sounding muddying; the lack of a proximity effect enabled us to preserve a fair amount of the sub-frequencies, to give the illusion of depth without flooding the bottom end. Vocal microphones are very much a personal thing, and every professional vocalist should try out several before picking the one they want to use. And even if that is just an SM58, you should still purchase and tour with your own – you don’t want to know who or what has been up close to the venue mic in the past. 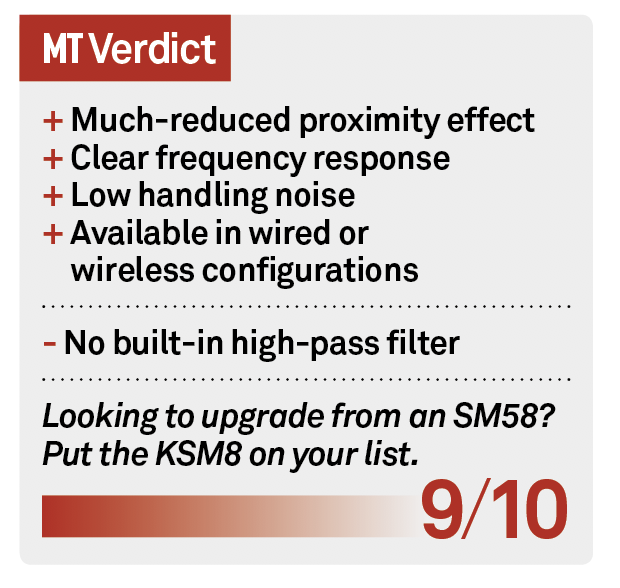 With the KSM8 now battling for your attention, you owe it to your voice to at least give it a try. 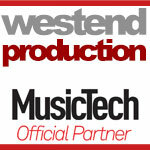 If you want to own one – enter our competition to win one here!